The average British child has visited four European cities and been on three long-haul holidays as well as skiing twice - all before their 10th birthday. 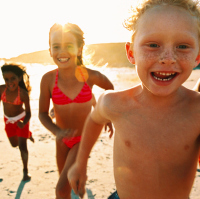 A team of researchers looked at the travel habits of British children now compared to previous generations. They found that the average 10-year-old child has done more travelling than their grandparents did in their entire lives. The study suggests many children have been abroad around six times by the age of 10, while grandparents had been abroad eight times in total. Many of the parents polled claimed that, while travel is a normal part of their own child's life, they themselves had only been on holiday twice by the same age, and had stayed within Europe both times. According to the research, carried out by Royal Caribbean, today's 10-year-olds have been on an average of two cruises, four ferries and seven aeroplanes. They have also swum in the Mediterranean four times, the Atlantic three times and the Caribbean Sea once. The average 10-year-old has also tasted street food abroad, visited a foreign market or souk, and learned as many as six new foreign phrases while abroad. Up to 83% of the 2,000 parents who took part in the study said their own children are better travelled and more cultured than themselves at the same age - although 83% also complained their children have no idea how lucky they are. Around 68% of parents said their children are actively involved in the researching and planning of holidays, and 73% said their children can now speak a foreign language as a result of their travels. Generational expert Dr Paul Redmond, who analysed the findings of the study commented: "For the travel industry, Generation Z is incredibly important. "Not only do they exert a powerful influence on their parents, they are a generation that care more about experiences and travel than any other generation. The travel industry must pay heed to the interests and wishes of Generation Z - flying to the seaside to paddle and sunbathe for two weeks isn't going to suffice for these young adventurers. Generation Z will be the biggest instigators of change within the tourism industry, if these results are anything to go by. Travelling abroad with kids? Get the travel insurance package to ensure everybody's covered.